Today i am going to show you some tips for getting organized for a trip. My family and I head to Tennessee several times throughout the year. We really love going to the Smoky Mountains and spending as much time there as we can. But because we go so often, I have to stay organized, not only with packing, but with things here at home as well. Here are a few of my tips for getting organized for a trip. Arrange for pets to be taken care of and have a backup! As a product reviewer, I receive a lot of packages so we like to place a hold on mail and packages for the length of our stay so that they are delivered while we are gone. This way, you don’t have to worry about lost or stolen mail/packages. Bloggers often have deadlines for posts so getting those drafted and scheduled before you leave lets you really relax and enjoy your trip without worrying about tasks on your blog. Arrange for any pets you have to be fed, watered and let out throughout the day (dogs). But make sure you have a backup in case your original pet sitter has an emergency. If you know you will have upcoming Dr’s. appointments, phone calls or other appointments, go ahead and schedule them or make the visits before you leave. Pay any bills you know will be due the week of your vacation. Especially if you pay your bills online or by phone. Go ahead and get them out of the way and taken care of just in case you are in a location where that isn’t possible. You don’t always have cell reception or internet capabilities when on vacation in remote areas. So get those things out of the way. Unplug all your electronics including computers, printers, microwaves and clocks the morning of your trip. This saves you the worry of power surges during storms or any unforeseen electrical problems. You may be wondering why I mentioned turning off the water to sinks and toilets. We live in an older house and have leaky faucets at different times of the year. Temperature changes make pipes swell, they leak, etc. So we always make sure to turn the water off to those things while we are gone so we don’t have to worry about coming home to wet cabinets or floors. It’s always better to be safe than sorry. It can be hard getting organized for a trip, especially if you have kids. So I have a few tips for organizing your packing list as well. Make a list of EVERYTHING you will be taking with you and save to Evernote or Dropbox. Charge all electronic devices (phones, laptop, tablets, cameras, video cameras, etc.) the day before your trip. Clear photos and videos from your phone, camera, etc so you have a blank canvas. Give your kids a packing list of things they will take and have them gather those things into one location for you. Pack a first aid kit, bottled water and snacks. Pack travel pillows, blankets, snacks and kids travel activities. Ok I have a standard list of things that we take with us each time we travel. Some things, like toiletries can be left unpacked. I have a travel set that gets replenished when we return from a trip and then repacked in the suitcase for spontaneous travel! But I have my standard list for other the other things that I have saved in Evernote. I can pull it up on my iPad or print it out for each trip and check off items as I pack. This is SUPER handy! 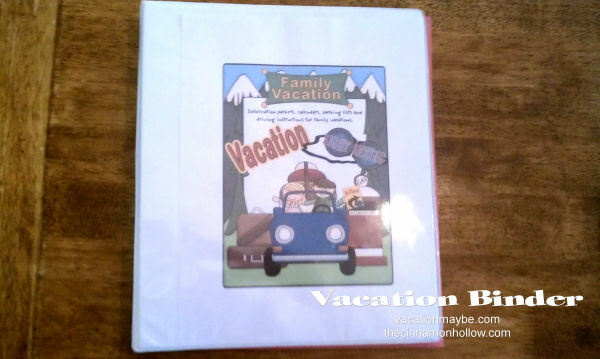 Along with my handy dandy list, I also have a vacation binder. We purchase attraction tickets on Groupon a lot so I print those, directions to our destinations, cabin rental policies, etc. and keep them in my vacation binder right beside my seat. Charge all your electronics the day before you leave so everything is fully charged and ready to go. I also have a solar powered charger that I charge up and keep in the vehicle with us so we can use it if someone else is using the car charger. I usually have hundreds of photos on my phone and camera from previous vacations and blogging gigs so I always make sure I save those to a disc and Dropbox and then clear them off my device so the media storage is empty and ready to roll! Print out a packing list for your kids with items that you want them to take. Have them bring all the items to you when they have gathered them up and then you can easily pack them. We have a first aid kit we made that is specifically for travel. It is made in a red vinyl lunch bag/cooler and has everything we might need. Bandaids, peroxide, antibiotic ointment, thermometer, Tylenol/Ibuprofen and all other sorts of first aid necessities. We travel to the mountains. There are black bears, timber rattlers, scorpions and all other sorts of wild critters so I want to be prepared! And lastly, if you are traveling with kids, be sure to pack travel pillows and blankets, travel activities and snacks and drinks to keep them occupied, refreshed and nourished while on the road. I usually put the pillows and blankets in the van the night before so they are ready when we leave bright and early. 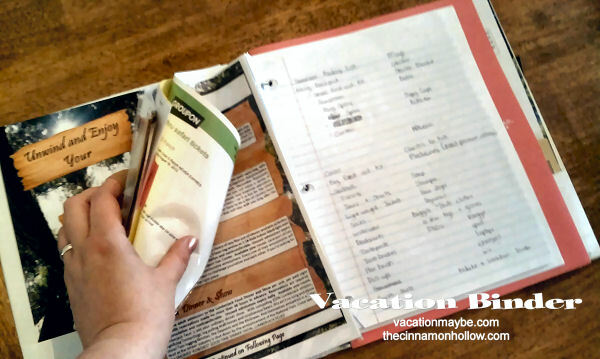 I hope you can use my tips for getting organized for a trip.